This is such a simple recipe to make & its packed full of protein from the delicious nuts & omega 3 fatty acids with the flax & chia seeds. One slice will satisfy any hunger craving & help balance your blood sugar levels. This is great way to start your digestion in the morning, or makes a nutritionally rich snack at anytime in the day. 1.Preheat oven to 180 degrees & line a loaf pan with parchment paper or coconut oil. 2. Mash banana in a large bowl. Add all ingredients to one bowl, (apart from the oats, & flour) & whisk vigorously to combine. Last add the oats & buckwheat flour & stir into your mixture. 3. Bake for 1 hour 15 minutes. When it is ready, it should feel firm & golden brown on top. Use a fork to test whether it’s cooked. The fork should come out dry if cooked. 4. Allow the loaf to cool completely before cutting. 5. Serve with organic honey or maple syrup or simply enjoy as is. 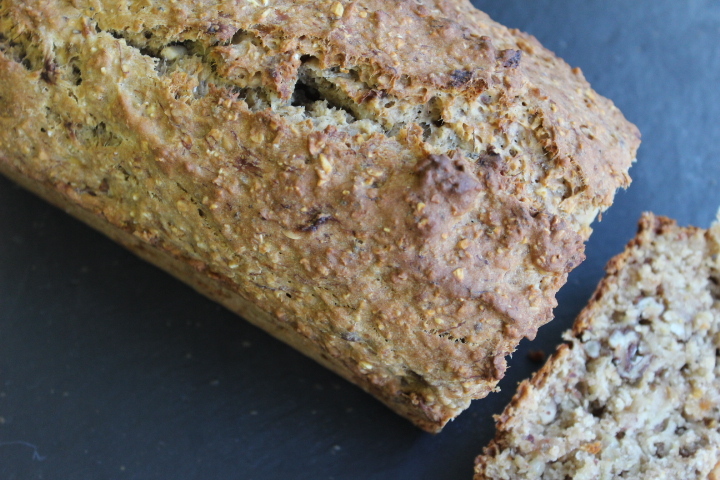 This Banana bread is so good for you as its full of amazing plant proteins from the nuts, as well as plenty of omega-3 fatty acids from the flax & chia seeds. Bananas are fantastic for you because they provide plenty of tryptophan, which is converted into serotonin. Serotonin is known as the “Happy- mood brain neurotransmitter.” As well as providing Vitamins B6, manganese, vitamin C, potassium, dietary fiber, protein, magnesium, folate, riboflavin, niacin, vitamin A & iron. I used raisins in this recipe because not only do they provide an additional sweetness, they are also a concentrated source of energy, vitamins, electrolytes, & minerals. In addition they provide you with anti-oxidants, dietary fiber, & other phyto-nutrients. This recipe will help balance your blood sugar level & really nourish your body with the vitamins & minerals it needs to function at its optimum level. other phyto-nutrients. This recipe will help balance your blood sugar level & really nourish your body with the vitamins & minerals it needs to function at its optimum level.